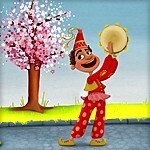 Norooz is a colorful children’s app that uses age-appropriate language and interactive features to explain the official start of the Persian New Year and the many traditions surrounding this festive holiday, which has been celebrated by Iranian people for more than 3,000 years. In the Norooz app we introduce not only Norooz and the spring equinox, but many other events and traditions related to the Persian New Year. For example, children will learn about Chaharshanbeh Soori, also known as the festival of fire, which is held several nights prior to the equinox; they will gain an understanding of a Haft Sin traditional table setting; and they will find out what happens on the 13th day of Norooz. To strengthen learning, we’ve included several interactive features, including a make-it-yourself Haft Sin table and a hands-on explanation of the spring equinox that helps children understand the earth’s revolving relationship with the sun.